As you know, congestion pricing would put a fee on bringing your car into the most congested area of the city: lower Manhattan. The fee would encourage some drivers to take public transportation. Other drivers would pay the fee, which would help fund better public transportation for the rest of us. Decreasing the terrible car congestion in areas like Manhattan (that have many transit options) would decrease injuries and lower pollution for everyone. If you are available, please come out tonight to encourage our politicians to take action. 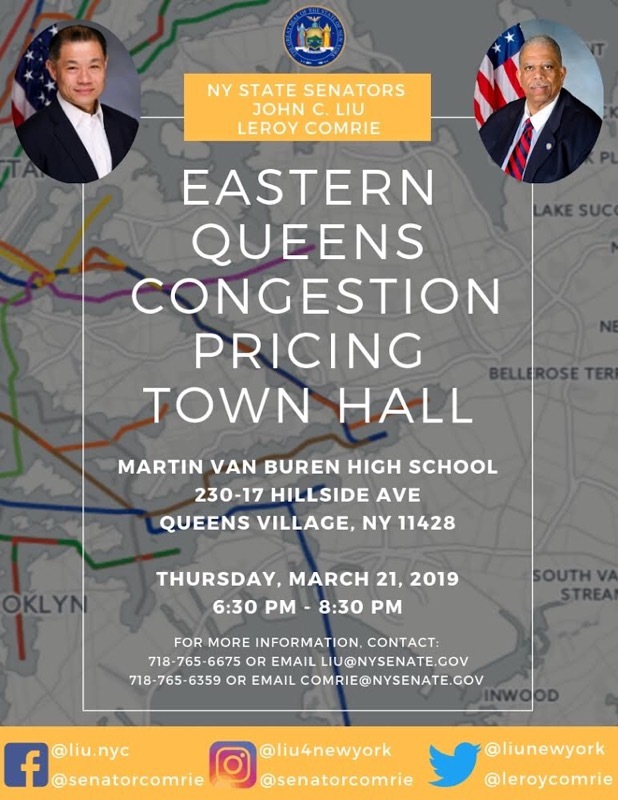 The lack of political will has left Eastern Queens transportation to stagnate for decades. Hopefully tonight can be the day that turns around and we increase funding for better transportation in our neighborhoods. These politicians have the power to make that happen, provided we encourage them to be bold. To read more about why we expect our politicians to take this opportunity to increase funding to transit, please see our recent public statement supporting the #FixTheSubway coalition. Next Post Learn to Ride in Eastern Queens this Spring!